The leader of “Koinobori club”, Ryoichi Morishita, is hard at work in his art studio in Ino town when I enter. He notices me, looks up and welcomes me with a smile. “This is my new work using small balloons,” he says. Interestingly enough, the balloons are wrapped in a kind of Japanese paper and are to be hung from the ceiling. They are shaped like colorful little fish. His colorful works are on display everywhere and most have a carp motif, like traditional koinobori, or “carp streamers”. People can only see these wonderful works in his studio. He creates new works every day, and not just carp streamers: postcards, painted stones, balloon fish, on and on. His ideas are playful and creative, so he can create new art from any material. “There are infinite possibilities in art.” he says. Ino town is located in the central part of Kochi prefecture and it takes about 30 minutes from downtown Kochi by car. There is a beautiful natural environment such mountains or rivers, and the Niyodo river in particular is famous in this area. It runs south through the middle of Kochi prefecture to the Pacific Ocean and it has been called the cleanest river in all of Japan. Ino is also famous for tosa-washi (traditional Japanese paper). It is one of local traditional product. It was designated as a traditional craft of Japan in 1976. In Ino town, Tosa-washi has been made for more than a thousand years because there are materials such as pristine water or plants which are indispensable for paper making. In addition, the town holds several events for people to enjoy the rich natural environment and traditional culture. “Niyodogawa kami no koinobori (Carp streamer on the Niyodo river)” is one example. It is held in Niyodo river at the beginning of May. They are mainly organized by the Koinobori club . The “Koinobori club”, a volunteer group, including Ryoichi Morishita, was begun by local people who were concerned to hand down the attractiveness of local traditional culture to the next generation. They are proud of their place and their culture so, “Koinobori club” was organized and they focused on the future of Ino town. “Let’s hold a Tosa-Washi event,” thought one member, “to preserve the tradition and the beauty of the river for future generations.” As a result, the “Niyodogawa kamino koinobori matusri” was born. Colorful carp are swimming peacefully in the Niyodo river which is the most cleanest and clearest in all of Japan. In the riverside, a lot of people enjoy watching those carp in the water, and spending time with their family or their friend. In addition, most of children are flying a carp streamer in the sky, flying a kite, and painting stone which pick up from the river. When lunch time comes, they enjoy various foods in “Niyodogawa Furusatoichi”, which is like food stall. People can watch such heart-warming scenes only in Ino town from 3rd to 5th May every year and everyone can enjoy it during those 3 days. This event makes people feel happy. 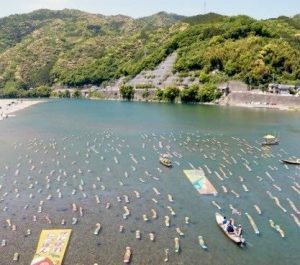 The event started in 1995 to mark the 100th anniversary of Ino town, so 100 carp streamers swam in the water. About 20 years has passed since that first event, but it still continues to this day. The number of carp are increasing every year and nowadays approximately 300 carp streamers are swimming there. Many people especially come to watch on the 5th May, Children’s Day, when in Japanese culture, carp streamers are hung out to celebrate children’s happiness. Usually, people raise the carp-shaped streamers called “koi-nobori” in the sky on the day, but these appear to swim like real carp in the Niyodo river. The end of event, those carp streamers are pulled up from the water, and they are presented to children for Children’s day. They get really happy after receiving these presents. One feature of this event is that all the carp streamers are made of paper, and yet can swim in the water in addition to the sky. It is unique and such carp might not be seen in other places in Japan. The paper which is used in all works is also unique. In this event, the materials of work is special Japanese paper called “不織布(fushokufu)” that does not rip when in the water. It was manufactured in Ino town. This event is held BY the local people, including the “koinobori club”, FOR local people. A few days before the start of this event, local people go to the river using riverboat and set up carp streamers in the river. They sink carp streamers connected to rope at the bottom of river. Through it is in the water, it does not move because the ropes are also connected by weight. And also, they control the balance between weight and float by putting Styrofoam in the carp streamers. Actually, all the carp streamers used in this event were created in Morishita’s art studio. “I usually begin to draw the design of carp in October, and we are painting it with all members after I have illustrated. All works are completed by February. Now I’m thinking about next year’s design, so I’m excited.” he said laughing. The event has just finished 2 months ago, but he is starting to prepare for next year. Originally, Morishita ran a shoe store, but set up the studio because he really liked to create something such as printing of art or various work of arts. And he is creating a lot of works even today. “I want everyone to feel the warmth of family not only the wonderfulness of nature through this event.” he said. When people visit this event for the first time, they will be impressed that children are enjoying with their family and they look really happy in spending wonderful time. He hopes that such as heartwarming scenery will continue to future. “But, recently our purpose of this event is changing” he said. He has own theme to creating his work on Carp streamer on the Niyodo river:‘For the children of future’. He really hopes to leave beautiful nature, traditional culture and warmth of people to the future through this event. He will be continue to drawing a picture and will be moved people’s hearts, through his illustrations. “Originally, the purpose of this event is to activating our local area, but now we are creating art and experience for the children and the future,” he said. Wow! I feel, really interesting event. I also want to participate. I like to swim in river. I surprised this event started from 1995. Nowadays, there are few opportunity to feel traditional Japanese culture in our life, so it is a good activity to feel it. And it seems so beautiful, so I think everyone can enjoy this event not only Japanese people and also foreigners!! I could lean not only this event but also the culture and Ino area. Mr. Morishita seems really kind and active. I haven’t been the event so I want to see them one day! I wonder that, what is the special technique of the paper that doesn’t melt in the water? This event seems so interesting! I want to join in next year! I never been to Ino town before. 300 carp streamers is amazing. I’m looking forward to see carp streamers swimming not only in sky but also in the river. I was very impressed by this statement. I agree with that and the important thing is how to express that to other people. And I guess the event is one of his way to express his art. I want to see that event while I am stay in Kochi. Niyodo river is cleanest river, I heard. But I heard Shimanto river is cleanest river, too. By the way, this story is unbelievable! Koinobori do swim! There were song about koinobori, but it’s just metaphor. This must be a great event decades later as well. I haven’t been this river but I can feel how clear it would be and how interesting this event with children would be. It was a new to me to know tosa-wadhi was used for koi-nobori.